I was tagged by Alethia from Never Ending Nail Art. This is the 'get to know me better' tag! 1.) Post 11 things about yourself if your going to participate. 2.) Answer 11 additional questions that the person who has tagged you is going to ask. 3.) Create 11 questions for 11 people that you are in turn going to tag. 4.) Tag these 11 people and let them know that you have tagged them. 6.) Your tags have to be legitimate tags. 1. I'm a certificated nailstylist since August 2011. I'm just doing it as a hobby right now because i'm really busy with the education i'm following right now. 2. I'm blogging for almost 2 years ( in June it's 2 years!) and I'm still trying to update every day. 3. I don't know how many nailpolishes I have, I just stop counting because they were too many. Maybe I will count them in a while, just for fun! 4. 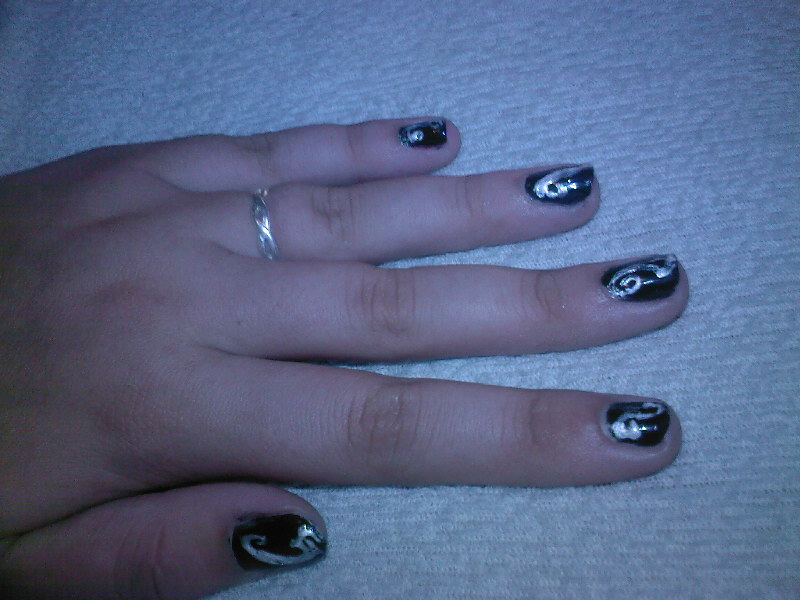 This was my first nailart trial (I think it was 2009?) Now i'm laughing so hard when I see this picture. 6. I promise a new stashupdate this month! 7. All polishes I have are used. There isn't any polish which I've never tried! 9. I've exams this and next week so I'm pretty busy with learning for them. After the exams I will start a new themeweek! 10. My head is one big choas. I loose everything (most of the time they're papers for school) or batterychargers for my phone or ipod. 11. I have a high heel addiction. I love high heels and have many of them. When I get the chance i'm walking on heels (except when I'm going to school, I don't want to run to the train on high heels!). 1. )What's your favorite food to eat? Actually I have two! I already am the first one (nailstylist) and my second one is to become a teacher in primary school. I'm almost done with my first year and everything goes alright with my education. So I hope I will have that dreamjob in 3 years! 3. )What are your 3 favorite things to do? Ofcourse: Polish my nails, read other blogs and I have actually no idea? 4. )If it were possible, would you go your whole life without eating or sleeping? I would love to have a life without sleep. I hate to go to bed and sleep way to less. But when I lie in bed I'm thinking: Gosh I've to do this and that etc.. 5. )What is your favorite brand of nail polish? 6. )What's your fondest childhood memory? I don't have very much memories of my childhood, I really don't know! 7. )About how many bottles of nail polish do you own? Here we go again, haha I stopped counting, I will give it a new try in a while, I will let you know! Without a doubt: Summer! I love warm weather, the sunshine and sitting in the sun without doing anything. 9. )How long does it usually take you to do your nails? 10. )What's your favorite gift to get? 11. )Any master tips for bloggers starting out? Be yourself, don't copy others and the most important thing: Have fun blogging! Don't be dissappointed when you don't have hundreds of visiters or comments, that will take a while! 1. Which polish do you use the most? 2. What's your worst nightmare? 3. Which kind of animals scares you the most? 5. If you could change one thing in your life, what would it be? 6. What's your favourite themepark to visit? 7. Which polish was a complete failure to buy? 8. If you had to choose: Polished nails with just one colour or nailart on your nails? 9. Long or short hair? 10. What's your favourite thing to read on nail blogs? 11. What's your favourite sport? So now you know a lot more about me, now it's your turn! Good luck ladies!